Not often I target stations in Puerto Rico, however WCMN is a dominant station on 1280 on Smøla island, so I sent a report to NotiUno. Quick response today. Heard on October 13 during a short, but intense opening towards New Zealand. Friendly response this morning. Star, previously Southern Star, is part of Rhema Media. Star from Wellington on 657 was also heard, but just barely. The 1494 transmitter is 3 kW and is shared with RNZ Parliament Radio. 15,850 km or just shy of 10,000 miles. WYCB surfaced briefly on Nov 11 with a full-hour ID, and I received a friendly response this afternoon. Only my second DC logging, but then there are only seven currently active stations. KLVZ is another Mount Loran reception, and belongs to the same company that owns KLTT below. A timely fade by the dominant CKJS gave way for this one. Thanks to OJS for spotting another super station from the super 1000 meter beverage at Mount Loran. Friendly email this evening. My 8th Colorado verie this autumn. I set up the KiwiSDR with the 310 degrees beverage for WSPR monitoring a few weeks ago. I mainly listen to the 160 meter band. Apparently I'm the northernmost member of the WSPR community. The map below shows the stations received by SWLKQ40LS (which is me) the past six hours. Transmitter power levels mostly 1 or 5 watts. Another great catch from the excellent opening at Smøla island on Dec. 6. Thanks OJS for v/s. I heard WITY on November 1, and after a couple of attempts a friendly response arrived this evening. Another Colorado station from the super, 1000 meter Mount Loran beverage! KJME's current music format is all-Beatles, so definitely a niche market. I couldn't find a recent logo, so below is how they looked like when they ran a non-Beatles format. Thanks OJS & OF for v/s. Heard at Smøla island in mid-September, friendly response last night after a couple of attempts. Another QSL from the good opening at Smøla island on Dec. 6. OJS spotted this, and a friendly response came within hours today. KVOR was one of two total surprises within one hour on 740, a frequency where CBX Edmonton AB is an almost total dominant. But once again, the super 1000 meter Mount Loran beverage proved its capacity. 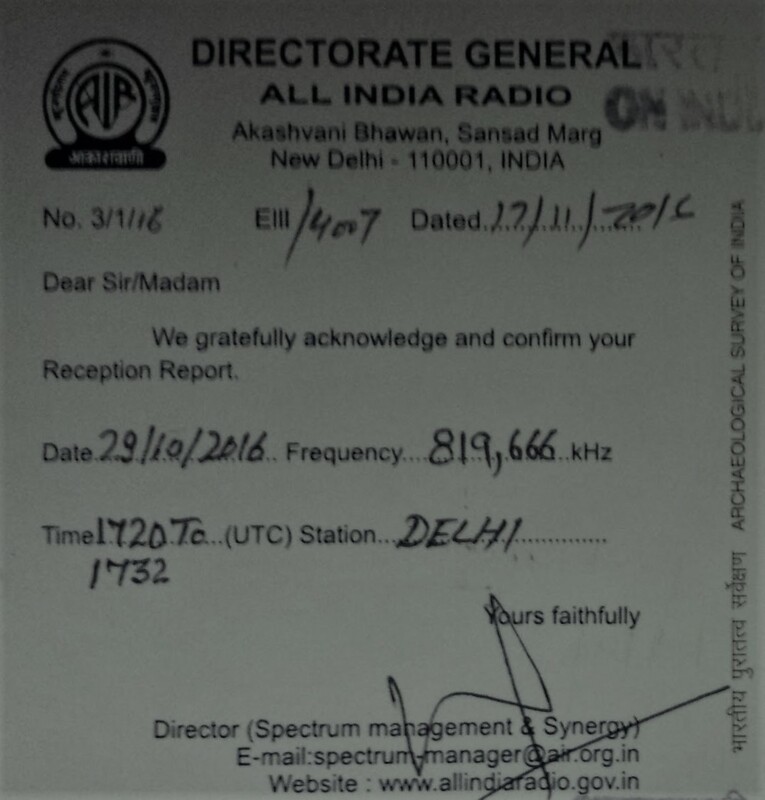 Detailed response last night from the CE who's also an active radio amateur. Heard during a good "southern" opening at Smøla island on the 6th. A technical glitch made this audible a few days ago, and Ole Forr spotted it. ID as "NPR 89.1". Detailed email this evening making it two AZ in a row for me. Who would have guessed. KPXQ surfaced with a fair signal on top of the hour a couple of days ago, and a friendly email made a most welcome addition to my meager Arizona collection. Thanks to Ole Forr I was alerted that KSDO, Radio Nueva Vida, was heard early in November. 1130 is usually a potent mix of 50 kW stations from across the continent, but at this time only CKWX was up, and as it faded down a few seconds after the full hour I got a good ID. Quick response tonight. KLTX 1390 Long Beach is more common, and was heard too with a better signal. WBKK took to the airwaves late 2012, and I heard them a few times that winter, but never with a proper ID. This changed this morning though. Very swift response to my report. WBKK is now part of the catholic Real Presence Radio Network, together with KWTL-1370 and KVXR-1280. Minnesota # 50. 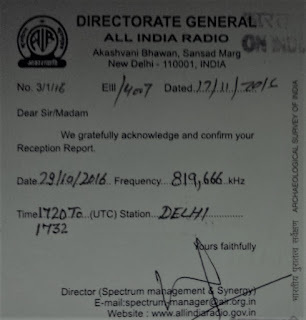 This Caracol station was heard back in 2012, but no response at that time. Good signal again some days ago, and a very quick response followed.